After my little trip to Portland, I came back very inspired, with lots of recipe ideas. I think I fell in love with the city, its beautiful trails and restaurant scene, not to mention the gorgeous neighborhoods with magnificent trees and greenery. Portland truly has great quality produce and what a wonderful city if you care for great organic and fresh food and the outdoors. It’s heaven. At least, I hope heaven will be like that. After a delightful lunch at Tasty n Alder, downtown Portland, where I ordered a salade niçoise and smoked trout board, it gave me the idea to play around with the salad, its content and texture. 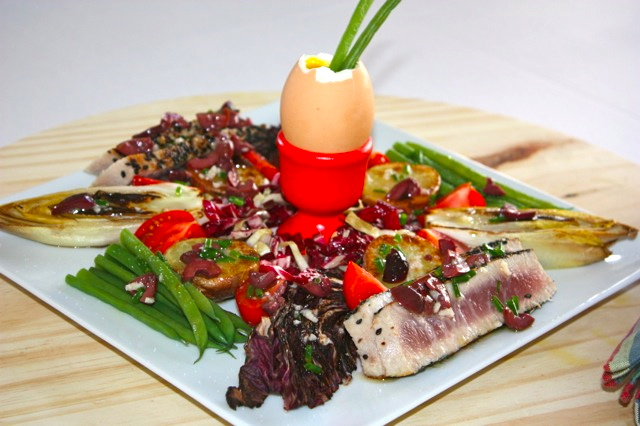 The traditional salade niçoise (from the city of Nice in France) has similar ingredients, except for the bitter greens which I added here. 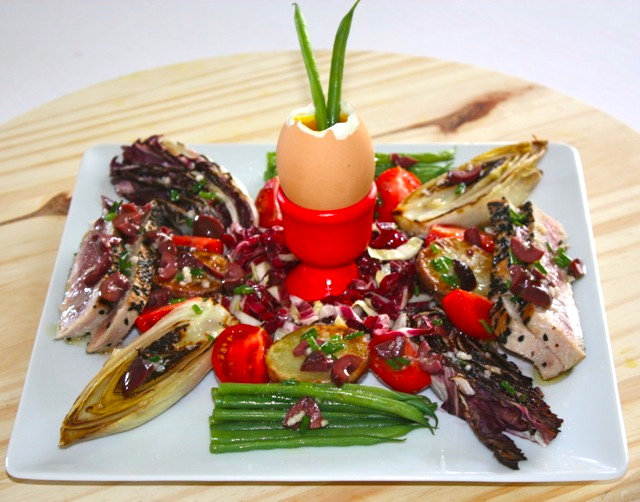 I grilled some radicchio and endive, and made my egg “à la coque” as we say (in the shell) instead of hard boiled egg. I did not add red peppers because I used a vinegar with infused red peppers. The potatoes are broiled in the oven and the salad is a mix of shredded endives and radicchio with anchovies and capers. This salad can be served lukewarm, or cold. I like it lukewarm when I am not in the mood for a salad. You need top ingredients to truly appreciate this salad. Get the best tomatoes, green beans and olive oil. There are different steps in this recipe, but well worth it. If you are in hurry, I would not recommend this, but if you have some time ahead and in the mood for a wholesome and delicious meal, try it out. Cook green beans in a pot of salted boiling water. Season potatoes with olive oil, salt and pepper and broil in the oven until golden brown on both sides. Heat up a skillet and grill radicchio and endive on both sides. Keep warm. In small pan, place eggs and count three minutes after the water started boiling. Remove from stove and cut the top of the egg. Coat tuna with white and black sesame seeds. Heat up a grill pan or skillet and grill on both sides, making sure not to over cook it. The middle needs to remain a little pink (or up to your tastes). Adjust with salt and pepper. Cut in 5mm slices. 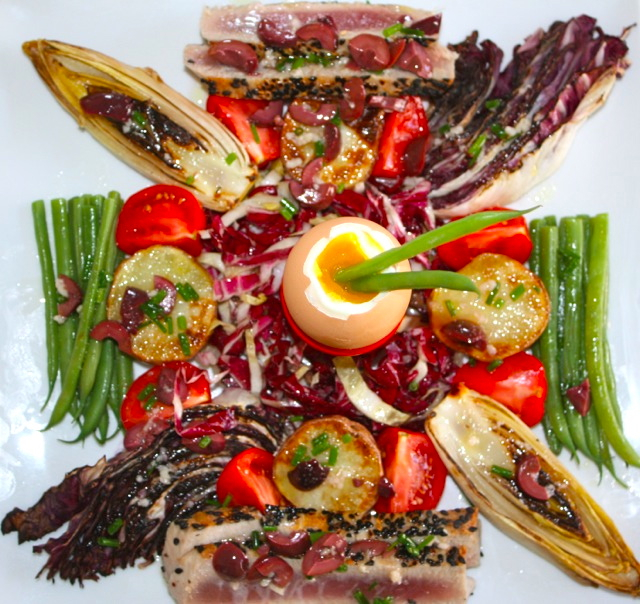 In a mixing container, combine shredded endive and radicchio and add anchovies, capers, olive oil, salt and pepper. Toss well. In a large plate, place one egg in the center of the plate. Arrange some shredded salad around. Place nicely all other ingredients around the plate. Drizzle with vinaigrette. This entry was posted by silvia on October 18, 2016 at 12:35 am, and is filed under Appetizers, Salads. Follow any responses to this post through RSS 2.0.You can leave a response or trackback from your own site.